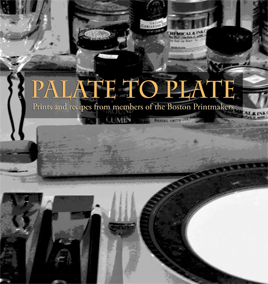 The Boston Printmakers is pleased to announce the release of Palate to Plate: Prints and Recipes from Members of the Boston Printmakers. This full-color, 216-page book is also the catalogue for the 2014 Boston Printmakers Members’ Exhibition at the Newport Art Museum (Fall 2014 – early January 2015). This beautiful book contains prints and favorite recipes by 99 members of the Boston Printmakers. The book is available through www.blurb.com. The ordering process is simple and easy. Delivery time is 2-4 weeks. There are discounts available for purchasing multiple copies.